DU’s new diktat making the Hindi Test compulsory to obtain a degree under CBCS doesn’t consider the fact that a lot of its students are from non-Hindi speaking regions. Does education really need a language after all? Read along to find out. 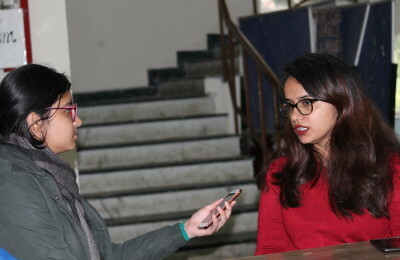 Delhi University has always been a melting pot of students from all over our country, (sometimes even outside of India) and it has always been a place that is a close second to the homes of people who aren’t from the capital. However, in recent times, the policies of our beloved University are changing and it is not for the better. A few weeks ago, DU issued a diktat stating that students who haven’t studied Hindi after 8th class in school have to give a Compulsory Test Hindi (CTH) under CBCS. Hindi was not compulsory in the Choice-Based Credit System (CBCS), implemented in the university a while back. The council made changes to the CBCS syllabus to make sure everyone graduating from DU knows basic Hindi. The Hindi test is already triggering a controversy as hundreds of students in DU colleges come from states where the language is not compulsory in the school curriculum. Students from the Northeast threatened to launch a stir if the Hindi exam is introduced. In 2013, when the university introduced compulsory Hindi and modern Indian languages, students from the northeastern states had protested. Deccan Herald reported that Dr. Ramananda Singh Mayanglambam, professor and nodal officer of the NE Cell in Kirori Mal College, said that he opposed the motion to make the Hindi test compulsory. His argument was supported by many others in the academic council meeting but was, however, left out of the notes. He also said that no executive meeting was held after that and the decision was made final and had already been set in motion. This comes as another brutality that outstation students have to face. How are they going to learn a language – and pass an exam on it – when they don’t speak that language and when they haven’t practiced it in years? While on one hand, colleges in DU try to promote secularity and diversity in culture, the University Board on the other seems to weighing down students with the burden of nationality and using language as a means. This isn’t 1947 anymore when a free Indian government strived to make Hindi compulsory across India just because it is spoken/used in majority – this is 2016, an era that is almost 70 years past that. This is the era where we expect Indians to have moved past boundary, language and culture based differences and to have realised the rightful concern for the minorities. But instead of accepting a diverse country, it is being made into a place where even students from different quarters are made to feel like outsiders. “Most of the students from my state have studied Hindi till 8th as their third language. Only a few would continue with Hindi after that. Asking them to take a test and qualify in a language very much alien to them just because it is supposedly our “official” language is absurd. Why is this being imposed? This is supposed to be a Central University and therefore, a secular space which would accommodate the diversity of its students, and not a space to impose hegemonic agendas,” says a Miranda House student who is from Kerela. To most people, this would seem like another rule thrown in by the University Board. But it is more than that – it is about one’s right to feel like they belong in their own country, in their own capital. It is about accepting diversity and spreading secularism and tolerance, especially in times like these, when the whole country’s integrity is threatened. That is why it is important for prestigious institutions like Delhi University to take a stand against this idea of a ‘forced national identity’ instead of propagating it. For those who don’t know already, India does not have any ‘national’ language per say, but ‘Hindi’ and ‘English’ are the official languages accepted for administrative reasons, but what indeed gives Hindi as a language the precedence or the pedestal position to be put as a criterion for one’s graduation is not just absurd but also something worth pondering upon.